WordPress is one of the popular content management systems, and more than 30% of websites use it worldwide. Its SEO abilities are time-saving and easy to implement. In this article, we’ll show you how to use the Yoast SEO plugin for WordPress and the best SEO practices to have a better website – one that Google actually likes. Crawling – Search engines’ ability to find all pages of your site. Indexation – Copying crawled pages to show them in search results. Low Quality / Duplicate Content – Serve only your best pages, and don’t confuse search engines with duplicate content. The Yoast SEO WordPress plugin is very useful because it has many Google- and user-friendly tips that you can set up in no time. We will continue to update this article as search engines, optimization practices, and the WordPress evolve. Provide the markup to be included in the Google Knowledge Graph. Verify your site in Webmaster accounts at Google, Bing, Alexa (Amazon site ranking), and Yandex (Russian search engine). Ignore this if you have your site already verified. Customize meta-tag templates for different types of pages. Prevent low-quality content — tell search engines not to crawl date, author, or pagination -based archives. Search engines will still crawl them but not index the content. The potential of SEO for WordPress category and tag pages is huge, but they require setup and useful content. Noodp and noydir in meta robots tag allow a page description only; the other directories’ descriptions won’t be used. Let Google know about your social accounts. Enter them in corresponding fields. Make your posts appear correctly in social networks: Facebook, Google+, Twitter, and Pinterest. Set the type of content you want to appear in XML Sitemap. Submit your new XML sitemap to the Google Search Console. First, you should need to enable “Pretty Permalinks” from initial settings. The defaults are work fine, too, so you can leave those as-is. This tool allows you to quickly change titles and descriptions of your posts and pages without having to go into the editor for each page. This tool allows you to quickly change important files for your SEO, like your robots.txt and your .htaccess file, if you have one. Import settings from other SEO plugins and export your settings for re-use on (another) blog. Implement a Google Search Console inside Yoast admin. You will have the possibility to fix errors just in time they appear – this is the best thing you can do for your site’s Search Engine Optimization. This section is dedicated to the most valuable part of SEO — the content. You will get some key points on how to create a proper SEO content. 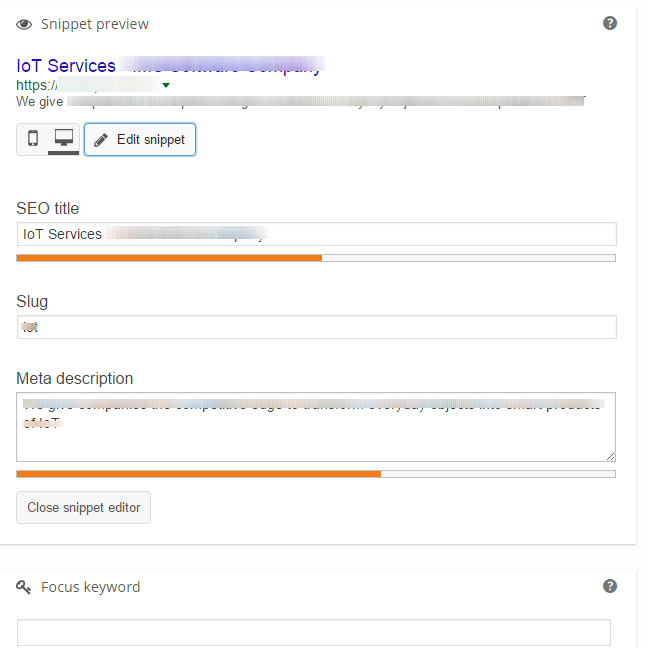 After a correct setup, you will have a title and meta description fields under each post and categories. An SEO-friendly post title is more than 70 characters length, is a human-readable, and optionally contains a focus keyword. When your page appears in the search results, the SEO title and the description in the search snippet will determine if the user will click on your site or not. For description, the search engines pick the most relevant part of your article, and the title usually remains the same. Make sure your SEO title describes exactly what people will get if they click on the link. Simplify your title, try using short and clear words. The title should also contain the right keywords that people would be searching for. A good description should explain your article in fewer words. Meta Description is also shown on social media sites like Facebook, Google+, and in Twitter via Twitter Cards. People are going to read your meta descriptions, so try to use your focus keyword at least one time, earlier rather than later. The Search Engine truncates your meta description after 155-165 characters. A focus keyword is a more secondary feature, it shows how many times the keyword is used in your post. WordPress SEO by Yoast allows you to choose a focus keyword for your individual posts. It also helps you find similar keywords as you type your focus keyword. The Yoast SEO WordPress plugin is constantly upgraded and is ready to use with the new version of CMS. Despite the WordPress-from-the-box and its Themes (the same as Templates) are actually well optimized, the Yoast SEO plugin for WordPress brings even more value to your site. So we congratulate you, as now you know what is a well-done SEO, and how to improve you website in seconds!